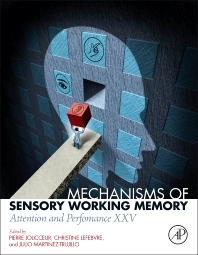 Mechanisms of Sensory Working Memory: Attention and Performance XXV provides an update on research surrounding the memory processes that are crucial for many facets of cognitive processing and experience, with new coverage of emerging areas of study, including a new understanding of working memory for features of stimuli devoid of verbal, phonological, or long-term memory content, such as memory for simple visual features (e.g., texture or color), simple auditory features (e.g., pitch), or simple tactile features (e.g., vibration frequency), now called sensory memory to distinguish from verbal memory. This contemporary focus on sensory memory is just beginning, and this collection of original contributions provides a foundational reference for the study mechanisms of sensory memory. Students, scholars, and researchers studying memory mechanisms and processes in cognitive neuroscience, cognitive science, neuroscience, and psychology will find this book of great value to their work. Is There a Sensory Working Memory? A Single or Several Capacity-Limited Stores? Where Are the Sensory WM Representations Stored? What Are the Parietal and Prefrontal Contributions to VWM? Chapter 6. What are the Roles of Sensory and Parietal Activity in Visual Short-Term Memory? Are Representations in Visual Working Memory Position-Dependent? Are Effects of Attention-Based Rehearsal Genuine Memory Effects or Are They Caused by Anticipatory Attention? Dr. Pierre Jolicoeur studies complex cognitive systems using EEG, MEG, NIRS, and fMRI. His primary focus is on fundamental mechanisms of attention and working memory in the visual, auditory, and tactile domains and how they mediate performance in single and dual-task situations. By leveraging the exceptional skills and knowledge of extraordinary collaborators, he examines these mechanisms in normal younger and older individuals, and in a number of special populations, including mild cognitive impairment and mild traumatic brain injury. Dr. Jolicoeur is a member of the Royal Society of Canada, and he is a full professor in the department of psychology at Université de Montréal where he holds the Canada Research Chair in experimental cognitive science. Dr. Martinez-Trujillo is an associate professor at the departments of Physiology and Pharmacology and Psychiatry and a scientist at the Robarts Research Institute, Western University, London, Ontario, Canada. He studied Medicine at the University of Havana, Cuba and continued pursuing his medical training in Neurology and Clinical Neurophysiology at the Cuban Neuroscience Center. He continued his scientific training and obtained an MSc and PhD in Neurobiology at the Neurology Department of the University of Tübingen, Germany. He came to Canada in 2000 to pursue postdoctoral training at the Centre for Vision Research, York University, Toronto. In 2004 he became a Canada Research Chair and assistant professor at McGill University Department of Physiology in Montreal, Canada. In 2014 he joined Western University as associate professor and Western Research Chair in Autism. Dr. Martinez-Trujillo’s scientific work is dedicated to investigate the brain mechanisms underlying cognition, more specifically underlying the allocation of attention, and how these mechanisms fail during neurological and mental disease. His work has been published and acknowledged in prestigious scientific journal such as Nature, Nature Neuroscience, Neuron, Current Biology, amongst others.